Our next Work Week will occur April 2430, 2019. All work at the PMCC Museum, including the sorting of items for input in the museum's collections, is conducted by enthusiastic volunteers. 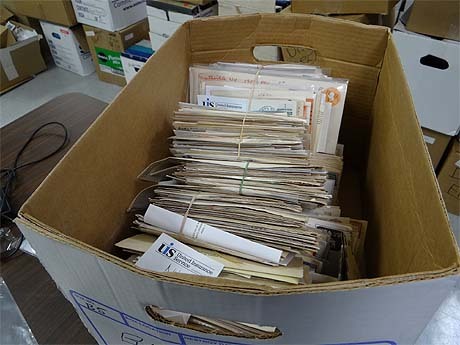 Twice a year groups (largely comprised of PMCC members) gather at the PMCC Museum to process material for the museum's various collections, including the full-cover, 2x4, and photo holdings. 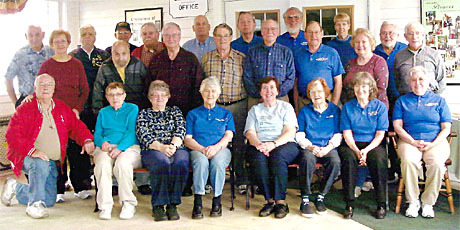 About two dozen people volunteer at the National Postmark Museum each Work Week. Those who've attended work weeks will tell you it's a worthwhile experience, and you need not be a philatelic expert to participate and enjoy yourself. There's great company, interesting postmarks, and home-made cookies fresh from Missouri! The work is not always easy but it is necessary to maintain the PMCC's gem of a museum. Fortunately, no one is alone in this endeavor. During Work Week the Museum bustles with great, knowledgeable, and friendly people. Carpools set out twice daily as volunteers enjoy Bellevue's nearby culinary offerings, including classic diners and pizza buffets. By volunteers' experiences, decent low-cost lodging can be had at: Bellevue Hotel & Suites, in Bellevue; or the Motel 6 or Super 8 in Milan, off I-80. Lodging is relatively inexpensive near the PMCC Museum at this time; Work Weeks are scheduled around [nearby amusement park] Cedar Point's off-season. Some long-time volunteers choose to share rooms with friends to further defray lodging costs. Volunteers who spend at least four full volunteering days at the Museum Work Week may receive a free night's lodging [up to $50]. Contact the Curator (see sidebar, top-right) for more details.